Savills Japan's latest Briefing - Residential Leasing Q2 2018 indicates that Tokyo's residential annual growth should remain healthy and continue its upward trend. Credit: Photo by Daryan Shamkhali on Unsplash licensed under . Credit: Source: Savills Research & Consultancy licensed under . Although the premium of C5W rents over the average of 23W rents shrank this quarter, the graph indicates steady growth in the average annual premium since 2014; having grown from an average of 11.9% in 2012 to stand at 18.1% as of Q2 2018. Savills Q2 2018 Residential Leasing Briefing reveals that average rents consolidated in Q2, as expected following the robust gains in Q1. Annual growth should remain healthy and continue its upward trend. Average mid-market asking rents in Tokyo's 23 wards (23W) stood at JPY 3,771 per sqm, down 0.5% quarter-on-quarter (QOQ) but up 3.2% year-on-year (YOY). Average asking rents in central five wards (C5W) stood at JPY 4,454 per sqm, down 1.7% QOQ but up 3.6% YOY. Both Inner and Outer North submarkets posted gains, rising 2.7% and 1.4% QOQ, respectively, while YOY growth was 2.2% and 2.8%. 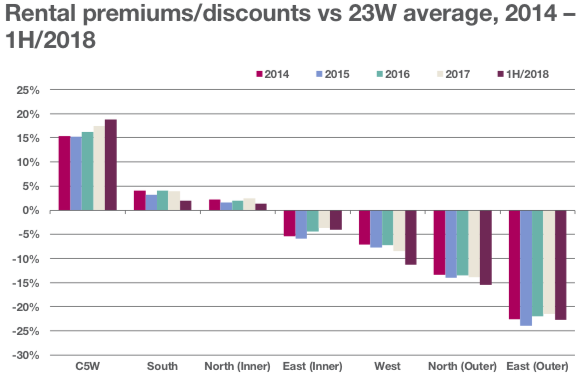 The C5W's rental premium over the 23W average stands at 18.1% up 1.3% since 2017. Average occupancy rates for institutional-quality assets temporarily dipped this quarter but are likely to remain high as demand for conveniently located and quality residences is strong. Increased upkeep costs for homeowners have the potential to boost demand for rental properties as purchases are postponed. "C5W average asking rents have remained above the 2008 peak for a second consecutive quarter. We expect growth in C5W rents to proceed steadily, supported by strong demand. Similarly, in the 23W we forecast continued growth in rents albeit at a slower pace." - Savills Research & Consultancy. As indicated in Savills previous briefing, rents gave back some of last quarter's gains in Q2 2018, with the 23W average dipping to JPY 3,771 per sqm, a decrease of 0.5% QOQ. Savills state that the quarter's consolidation is expected, and does not disturb the longer term trend with annual growth remaining strong at 3.2% YOY. Tokyo's rental market is principally made up of compact single-occupied units, approximately 45 sqm (13.6 tsubo) in size. Savills explain that such units can make up as much as 75% or more of the 23W area's rental listings. Unlike other major cities such as London and New York, house or apartment sharing does not form a major segment of the rental market and as such, there is a large and stable market for small- to mid-sized units. Average occupancy rates in Tokyo remain high with the current 23W average 0.2ppts higher than the prior year at 96.9%, though this is 0.5ppts lower than last quarter. C5W average occupancy fell more than the 23W average this quarter, down 1.1ppts QOQ but still up 0.2ppts YOY, finishing Q2 2018 at 96.1%. According to Savills, repair costs appear to have risen by approximately 20-30% since spring 2013 and will most likely continue to rise beyond the Olympics in 2020. Asking rents in the C5W have remained above 2008 levels for two consecutive quarters, despite correcting, this quarter after an exceptionally strong prior result. The 23W should experience continued growth in rents, albeit at a slower pace than in the C5W, eventually surpassing its own watermark. Over the medium term, increased repair costs which show no sign of abating will add to homeowners' running costs, as will the increased contributions to limited reserve funds which may not be able to maintain the quality of apartments. Occupancy in institutional-quality residences is strong and unlikely to weaken, as their high quality and convenient locations are attractive to prospective tenants. Even if global economic uncertainty persists, negatively impacting capital markets, mid-market residential properties in Tokyo should remain relatively stable and attractive to investors given their defensive qualities. Click here to view Savills Briefing - Residential Leasing Q2 2018 report. For more information or to discuss the report, email Tetsuya Kaneko of Savills Japan via the contact details listed below.